The birthplace of of David Livingstone, the 19th-century explorer and missionary. 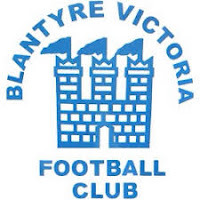 Blantyre Victoria – The Vic founded in 1890. Lanarkshire League winners 6 times, the first 1892–93 and the last occasion in 1926–27. Central League Division 1 champions in 1995-96 and 2014-15, Division 2 winners in 2005-06, 2008-09 and 2013-14. Cup honours include the West of Scotland Cup in 1943-44, Central League Cup in 1976-77 and Lanarkshire Junior Cup winners nine times. Capacity is 2,500 with a record crowd of 6,000. 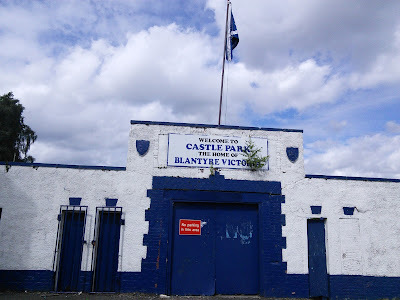 Castle Park has obviously seen better days but it’s discrepancies give it plenty of character. 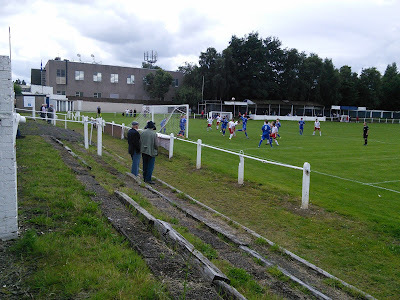 There is a standing terrace on the far side, which is covered although some parts of the roof are missing, with the team dugouts sitting in front of the stand. 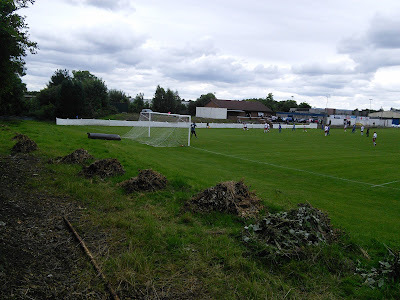 There’s terracing behind the Forrest Street goal with the canteen near the corner and wooden sleepers which are used for seats (careful not to get splinters in your backside) in front of the central changing rooms. The ground is three sides as the top goal is a grassed in front of the neighbouring houses. Weather:warm first half, persistent rain second half. A late goal by Stephen Gray clinched victory for the Vale in an entertaining League Cup opener. 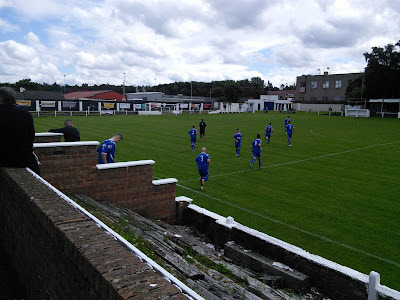 They got off to a fabulous start when they were awarded a penalty with just 24 seconds gone, which was confidently converted by James McKinstry. Vics equalised on 25 minutes when a good left wing cross was headed home by Jack Marriot , and they looked on course for victory when Ross Smith latched onto a neat through ball to round the keeper and score. That lead lasted just five minutes when a ball from the left flank was nodded in at the far post by Scott McManus on 78 minutes. Then with just three minutes remaining a peach of a cross by McKinstry was headed home by Gray to grab the three points. 1003 Virgin Trains Carlisle to Glasgow. 1206 Scotrail service to Blantyre took 20 minutes, where I met James Little who had travelled across from Edinburgh. 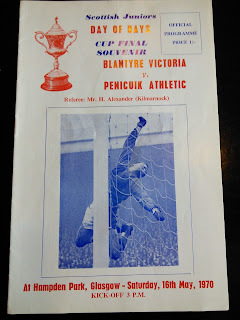 I promised we would tick off the Vics together as he saw them win it, attending both 1970 finals at Hampden Park supporting his Junior team Penicuik Athletic. We ventured into a couple of pubs … The Old Original Bar, where we were greeted with suspicion, thinking we were a couple of strangers in search of the Rangers v Hamilton match on TV. After a swift pint we stopped off at The Stonefield Tavern which we were quite surprised to find was actually a Rangers bar, as there was no clue of this from the exterior.The pub is decorated with club jerseys and memorabilia, but unlike the last boozer, no Gers game on the tele. On returning caught the 1618 train but alighted at Rutherglen to tick off the Wetherspoons then caught the 1731 to Glasgow. Bevvy in the William Rufus before the 1941 Northern Rail back to Newcastle, arriving back on Tyneside at 2110. Cracking day as usual …24 down, only 4 left on My trail of the Scottish Holy Grail. 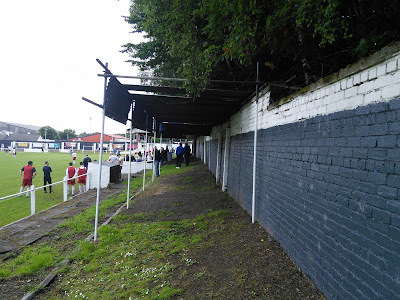 Plenty more on the town of Blantyre, the club and my Matchday in my forthcoming book on the winners of the Scottish Junior Cup over the last 50 years.